Industrial logging operations, safari parks, carbon offset credits and climate change are all threatening the Baka people's age-old way of life - as well as their rainforest's precious biodiversity. The Sapelli and Moabi trees are in danger from the global demand for timber. In the Cameroon rainforest recently I met a Baka family whose son had accidentally sliced his finger on his brother’s machete. We found them by following his screams of pain, the three children emerging onto the trail from under the roots of a tree. I offered his father clean tissues to mop up the blood seeping down the child’s arm. They thanked me with a portion of fresh honeycomb wrapped in a leaf, while mum treated the wound with a leaf poultice. Later they would apply honey as a natural disinfectant, and concoct a painkiller from tree bark. We parted and I last saw them heading into the forest as we tried to reach the car before dusk. It would be weeks or months before they returned to the road. Back home I found myself bombarded by ongoing arguments about what we should all do to address the challenge of climate change. For Europeans and North Americans it’s relatively straightforward – we can cope by giving up gas guzzlers for more efficient cars, by eating less energy intensive food, and by paying more for our foreign holidays. For the African rural poor the answers are more challenging. I wondered how that Baka family would cope with the new political climate engulfing their home. Most government donors are now entranced by the idea that carbon offset credits will reduce global forest clearance, thereby helping them to meet their international carbon-cutting commitments. The long-term hopes of many conservation organisations hinge upon future payments like these from the North to the South to pay for “Reduced Emissions from Degradation and Deforestation,” otherwise known within policymaking circles as REDD, providing funds needed to fund protection of “their” parks. At the climate change conference in luxurious Cancun this month they are working hard to turn this into reality. I know that industrial loggers also cannot wait for the massive subsidies they might receive from donors in return for a cynical nod towards high environmental and social standards. Carbon offsetting could enable them to extend their hold over Congo Basin forests to meet the global demand for timber. They are already systematically stripping valuable tree species from thousands of hectares of rainforest, undermining global biodiversity. 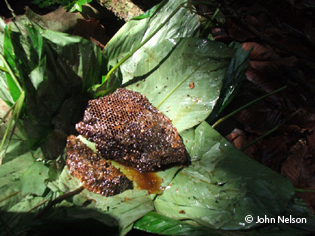 This disappearing biodiversity includes the Sapelli tree, a seasonal source of protein and income for indigenous communities who collect the caterpillars feeding on its leaves, the Moabi tree, a key source of valuable fruit and oil from its nut, and other tree species in which bees set their hives and produce delicious forest honey – the only source of sugar in the forest and a prize for which Baka regularly risk their lives scaling giant trees. Like most hunter-gatherers in the Congo Basin, Baka in Cameroon walk up to 25 kilometres from their villages and camps to secure meat, fish, fruits, honey, leaves, mushrooms and medicine. Over the year a typical community uses up to 120,000 hectares to secure its subsistence. For millennia they have been working the forest – almost no part of the Congo Basin is untouched – and for decades their environments have been recognised for their high biodiversity. Meanwhile commercial operators have been exploiting the forests for timber, wildlife, minerals, and soon, oil. In order to protect its forest biodiversity in 1994 the Government of Cameroon signed up to the Convention on Biological Diversity (CBD). Article 10c of the CBD protects communities’ traditional forest rights. 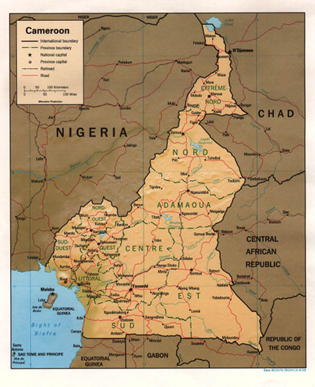 Around the same time international donors now advocating carbon offsets projects supported the establishment of a series of new parks across Cameroon, along with a forest zoning exercise that completely ignored local communities’ customary rights. 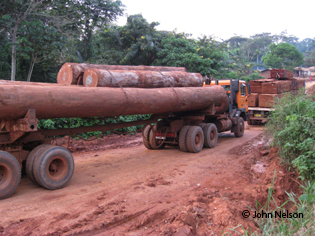 With the exception of a few narrow agricultural bands along roads, the bulk of Cameroon’s forests were handed over to commercial loggers and private safari operators. Local communities and especially indigenous Baka were never consulted about these changes, and they did not consent to hand over their forests to outsiders who now marginalise them from its management. The result is an air of intimidation and violence against indigenous communities struggling to maintain their livelihoods in forests straddled by parks and safari concessions, and uncontrolled logging almost everywhere. Thanks to the new climate change challenge, rural communities all over the Congo Basin will suffer as more loggers move in with their machines, more protected areas are plonked on top of their ancestral lands, and more paramilitary patrols move in to enforce the boundaries of parks and safari areas where indigenous people used to preside. 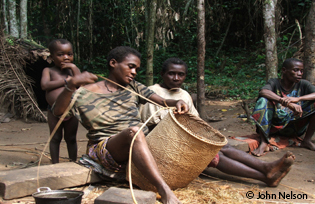 Pygmy hunter-gatherer communities have a lot to lose from this 21st century commons enclosure. The rights of indigenous peoples need to be protected as carbon credits descend from the North. Enabling their full and effective participation in the management of Congo Basin’s biodiversity will also help other forest dwellers cope with the climate change challenge. The burgeoning global demand for biofuels – another awkward result of climate conference deliberations over their afternoon cocktails – has pushed up palm oil prices and is resulting in deforestation on a massive scale in places like Borneo. Many of the newest palm plantations in Indonesia overlap local peoples’ customary lands, resulting in radical declines in biodiversity – from rainforest to monoculture, diversified incomes to plantation labour. This industry is heading towards Africa as it seeks out new lands. We know of course that forests can recover, even from fire – the historical record says savannah once ruled Congo Basin forests – but those time scales are irrelevant to a very poor, marginalised population suffering high mortality from simple diseases, but without access to modern medicine. They want that medicine, by the way. They made me promise to let you know.